Quinnipiac may have ended its season on the ice in tough fashion losing 3-1 to the defending national champion Minnesota Duluth Bulldogs in the Midwest Regional Final. While the season is over for the players that doesn't mean the coaches are done either as they are making preparations for next season along with plans of what individual players need to improve upon along with filling out next years roster with new players coming in. Here at the blog we are the same way. If news breaks we will report it, if we have blog articles to put out we put them out. Two weeks ago Quinnipiac picked up a local player with the news that Westport, Connecticut native Matthew McGroarty committed to the Bobcats. I had a chance to do a Q&A with Matthew to talk all things hockey with him. Thanks to Matthew for taking the time for this question and answer piece. BobcatsHockeyBlog: First off Matthew, Congratulations. What you are your thoughts and emotions like after making this decision to commit to Quinnipiac? Matthew McGroarty: Thank you very much. Honestly I was shocked. I didn’t know what to say and almost started crying on the phone with coach Rand Pecknold. But as of now, I am committed to a dream school of mine. But I need to focus on getting bigger, faster, and stronger so I can be ready to play at the collegiate level as soon as I can. BobcatsHockeyBlog: Tell us about your overall recruiting process. When did Quinnipiac first reach out to you, to show their interest in you joining the program in the future? Matthew McGroarty: They first showed interest when I played in their recruiting camp in the summer and they showed a bit of interest from there. Then I visited the amazing campus a few weeks later and then they gave me the call three weeks ago with an offer. BobcatsHockeyBlog: What other programs showed interest in you as a player? A source told me that some Hockey East teams were in on you. Matthew McGroarty: There were other programs that did show interest in me such as Boston College, Union and Colgate but I obviously liked Quinnipiac the most. BobcatsHockeyBlog: Was playing close to a home a factor in your decision to commit to Quinnipiac? Matthew McGroarty: Yes for sure. My family is a huge part of my life and it is extremely important to me, so I loved the fact that they could easily drive the 30-40 minutes to see me play because really, I couldn’t have done this without them. BobcatsHockeyBlog: You were coached by an NHL Hall of Fame player in Marty St. Louis with the Mid-Fairfield midget program. What did you learn from him that has made you the player you are right now with a Division I commitment? Matthew McGroarty: He’s the best coach I’ve ever had by far. If I didn’t have him as a coach, I don’t think I’d be committed to a Division I school. He has taught me almost everything I know about hockey to this point. A few things that he’s taught me are that hard work always beats talent and that nothing comes easily, not just in hockey, but in life, so in order to achieve your goals, you need to give 110% all of the time. 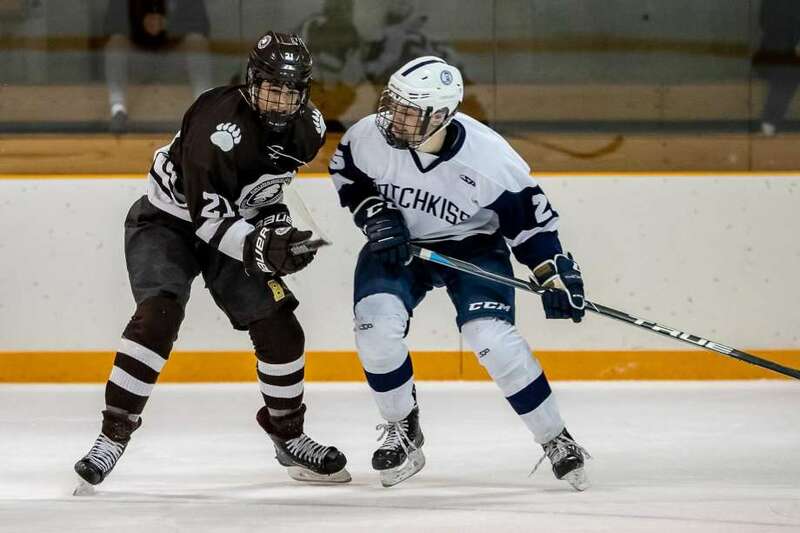 BobcatsHockeyBlog: You currently play prep hockey at the Brunswick School. How has your time gone there as a player? Matthew McGroarty: I’ve been at Brunswick for the last two seasons. The first season myself, Paul Davey (Boston College), and Ryan St. Louis (Northeastern) were just freshman so we didn’t get that much playing time. But this past season, I played a lot more comfortable with the pace and skill of the prep school level games. I also played on the first power play with those guys and players like Charles Shaffer and Cooper Moore really helped me grow my offensive game. BobcatsHockeyBlog: What are your goals the next two seasons at the Brunswick School? Matthew McGroarty: One of my goals, as I said before, is to get much bigger, faster, and stronger as well as develop my game in all aspects so I can be ready for my time at Quinnipiac. But on top of that, I’m really focusing on increaseing my production rates because as a true junior next year, I need to produce a lot more points. BobcatsHockeyBlog: Tell us about your overall game as a player. What are some of your strengths? Matthew McGroarty: One of my main strengths, as a center, is my defensive ability. But also I think I play with high pace and that I’m strong on the puck. I rarely use anything flashy, but I like to take the puck hard to the net and score dirty goals. So as a player, I want my coach to trust me at all times and areas of the game. BobcatsHockeyBlog: Outside of getting bigger, stronger and faster what are some areas of your game you want to improve upon? Matthew McGroarty: I want to improve the scoring and play making ability part of my game which will hopefully in turn, increase my point production as a player. BobcatsHockeyBlog: Is it your plan to play through your senior year at Brunswick or do you think you may head to the junior route prior to graduating? Matthew McGroarty: That is something I have been discussing with my adviser and my parents a lot of recently. As of now I don’t have an answer to that, but depending on how the Brunswick season goes next year, then a decision will be made for my senior year. BobcatsHockeyBlog: Has the Quinnipiac coaching staff projected when you would arrive? I have you projected for 2022-2023 with you playing possibly two more years at Brunswick and a season of juniors. Matthew McGroarty: That sounds like the right number of years. They said depending on the decision with Brunswick, they want me to play a year of juniors and see how that goes. BobcatsHockeyBlog: Is there a player that you try to model your game after? Matthew McGroarty: I definitely try to play like Patrice Bergeron of the Boston Bruins, not only does he light it up with a ton of points every year, he’s heavily relied on defensively for the Bruins. So I definitely try to play like him. BobcatsHockeyBlog: To this point in your life who has been your biggest influence to get to this point? Matthew McGroarty: I think my biggest influence would be either my father or Marty St. Louis because they both taught me things about not only hockey, but about life as well and I couldn’t thank them enough for that. BobcatsHockeyBlog: What should the Quinnipiac community expect from you as a person on and off the ice? Matthew McGroarty: I think on the ice Quinnipiac should expect a leader, someone who cares more about his teammates than himself, and someone who wants to push everyone to the best of their ability. Off the ice I think the Quinnipiac community should expect someone who’s a nice, caring person, that is always around to help out. BobcatsHockeyBlog: What do you like to do when you are not on the ice playing hockey? Matthew McGroarty: I really like to hang out with my friends. I’m a pretty social guy so being with my friends is always a lot of fun.